Did you know that you can use the Document Lifecycle Viewer in VISUAL 7.0 to track your sales process from quote to cash receipt, and your purchasing process from purchase requisition to payment? Use the Document Lifecycle Viewer to track your sales process from quote to cash receipt, and your purchasing process from purchase requisition to payment. You can easily access the various documents that make up an individual sale or purchase. 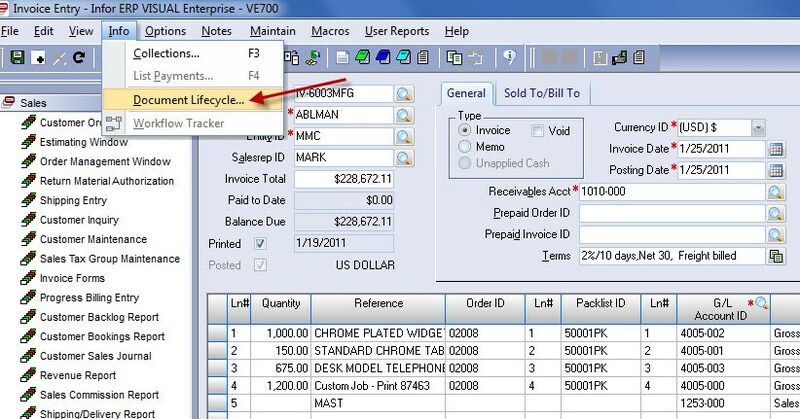 You can access the Document Lifecycle Viewer directly from Quotes, Order Entry, Order Management Window, The Manufacturing Window, Return Material Authorization, Shipping Entry, A/R Invoices, Cash Application, Purchase Requisitions, Purchase Orders, Purchase Receipts, A/P Invoice Entry and A/P Payments. All VISUAL Users are welcome! Member fees will be assessed annually in January of each year. Members joining mid-year will pay pro-rated membership for the remainder of the membership year. Annual membership fees are non-refundable. Cash or check are the only available payment methods at this time. Registration for 2012 enrollment will be accepted starting Friday 12/23/2011 and are due by 1/24/2012. Please email Candy Cole or call 612-207-3695 for questions or additional information. BizTech’s Second Annual VISUAL User Conference - Moving Forward with Infor10 ERP Express (VISUAL) - will take place March 18 through 20, 2012 at the Holiday Inn Chicago Mart Plaza in downtown Chicago, Illinois. For less than the price of one day of consulting, Infor ERP VISUAL users will be able to attend educational sessions covering a variety of VISUAL manufacturing, financial and technical topics. Breakout Sessions will be conducted by BizTech's VISUAL Consulting Team and Application Experts from Infor Global Solutions. By attending the BizTech 2012 VISUAL User Conference, you will have the opportunity to network with fellow VISUAL users, the entire BizTech VISUAL Team and Infor Representatives. In addition, you’ll be able to see a variety of technical solutions from BizTech partners in the VISUAL Solutions Center. Conference Highlights include Welcome Reception on Sunday evening, a Networking Event on Monday evening, VISUAL Application and Technology Breakout Sessions, one-on-one VISUAL Consulting sessions and a VISUAL Solutions Center. Did you know that you can modify the personal menu in VISUAL by adding new groups to create a daily reminder and to-do list? A good idea is to add new groups for each day of the week. You can then add the programs that you need to run each day. The personal menu then becomes a daily reminder and to-do list. From the MAIN MENU, select FILE and then PERSONAL MENU. Select ADD NEW GROUP, then enter a Group Caption and select an Icon of your choice. The new Group will be added to the Personal Menu. Presto! Your new Personal Menu Item will now be available in all of your personal menus in VISUAL. This VISUAL Did You Know? Tip was brought to you by Bill Price, VISUAL Sales Representative at BizTech. Infor, a leading provider of business application software serving more than 70,000 customers, today announced that it will relocate its headquarters to New York City in the summer of 2012. Located in "Silicon Alley," known for its high concentration of Internet and technology companies, Infor's new headquarters will feature an Innovation Center, where Infor will house newly-hired software engineers and graphic designers. "Infor's commitment to move its headquarters to New York is another sign that international, high tech companies see this state as the place to be," said Governor Andrew Cuomo. "I have repeatedly said that our number one mission is getting people back to work. This deal is an example of how we are working tirelessly to make sure companies know that New York is open for business." Infor expects to have one of the largest software engineering teams in New York City and access the rich pool of technical talent in the region. The planned technology campus the City of New York is building in conjunction with major universities was also an attraction for the company, along with the city's accessibility for Infor customers from around the world. "Infor's relocation of its headquarters to New York City is another vote of confidence in our booming tech sector," said Mayor Michael R. Bloomberg. "This growth in the tech industry demands a large, dedicated work force, and that's why our Applied Sciences initiative to build a new engineering school here is so important. It's just one of the ways we are supporting the tech sector so that companies like Infor can grow and create jobs in New York City." "2011 has been a strong year for Infor, with three consecutive quarters of year-over-year double-digit growth that have fueled our decision to accelerate investment in product innovation by coming to New York's Silicon Alley," said Charles Phillips, CEO of Infor. "This state-of-the-art facility will enable us to hire and house developers and graphic designers to enhance the user experience and integrate social applications into the workplace, further advancing the speed of business for our customers. We also plan to build a customer center that showcases these innovations in an environment as compelling as the technology itself." Infor's new headquarters will be located at 641 Avenue of the Americas, and will feature an open, loft-style design. The layout will fuel product innovation by providing an environment conducive to collaboration and transparency, with no traditional executive corner offices. Infor's current headquarters in Alpharetta, Ga. will continue to operate as its main shared services center, housing critical functions such as finance, human resources and tax. Cushman & Wakefield represented Infor in the deal. About InforInfor is a leading provider of business software and services, helping more than 70,000 customers in 164 countries improve operations and drive growth. To learn more about Infor, please visit www.infor.com. For information about Infor10 ERP Express (VISUAL), visit http://www.gobiztech.com/. Wouldn’t it be nice to have dynamic and accurate reports at your fingertips? Infor10 Query & Analysis is a multi-language, multi-currency reporting tool that is powerful, flexible, secure, and easy to use. The solution’s integration with Microsoft® Excel enables quick user adoption with minimal training and technical skills. Using familiar desktop applications, users can quickly and efficiently create reports that highlight trends, patterns, and exceptions. And since minimal IT support and involvement are required, maintenance is easy. Get users up and running very quickly with minimal IT involvement. Provide answers to critical business questions on demand. Display a better understanding of trends, patterns, and exceptions affecting your business. Discover how your organization can benefit from this exciting new solution. An ERP system will do anything and everything I need it to do. This is a myth! If properly implemented, operated and maintained, most modern ERP packages are so powerful and sophisticated that they can do endless tasks; however, they do vary in the levels of complexity they can handle, and most can only handle certain functionality to varying degrees of success. While an ERP system makes the lives of its users much easier by automating tasks, it still needs people to operate, use and maintain it. The system can only deliver the promised benefits if the employees are trained to use it, if the managers actually use the decision-making capabilities of the system and if the system is properly maintained. While looking for the perfect ERP software package, thinking that an ERP system will take care of everything is a recipe for disaster. Therefore, when looking for a package you should make sure to define your desired business processes so that you can see the ERP package in the context of your organization’s workflows. You should see the software perform your business processes, so that you can really evaluate whether or not the package will handle the intricacies of your business. Wouldn’t it be nice to get timely and transparent access to the most important product information so you can make more informed decisions quickly; shorten the change and approval cycle times; minimize scrap and rework; and collaborate more efficiently across the enterprise? True CAD neutrality that is fully integrated with the PLM—Work within your CAD application and send BOMs, product structures, engineering change orders, business processes and workflows inside of PLM all from your CAD system. Be able to take advantage of true CAD neutrality with CAD integrations to all major MCAD and ECAD systems and have all of them incorporated in a single product structure. Robust PLM functionality—Manage items, bills of material, documents, engineering change processes all within the PLM system. Manage all design and engineering change with robust and easy to use functionality that allows you to develop high quality products. Revision control—Ensure that you are designing and manufacturing to correct revision level of parts or documents by taking full advantage of Infor PLM’s advanced revision control capabilities. Get the design right the first time without having to go back and re-design and not know what the current revision level is for an item or part. Manage the lifecycle of a part or an item throughout its revision history. Did you know that you can remove an extended query in VISUAL? There are many reasons why you might want to remove an extended query. You may have inherited modified QRP reports where something is just not right, you want to diagnose a problem that surfaced, or you might want to enhance an existing report and need to temporarily remove the existing extended query. Whatever the case, there is way to do this. Standard reports within Infor ERP VISUAL are performed within executables in which inputs to the report are hard coded into the executables. Extended queries allow desired information that isn’t an input to be added to the report as a variable linking data to the report. First, make a backup copy of your modified QRP file (just in case). Go to the formulas in the object tree on the left and find the one named SQLQUERY. Right click on SQLQUERY and select properties. Make sure the SQLQUERY is in the middle window box and click Select Formula. Click the delete button then the OK button and confirm that you want to delete the selected formula. Go to the Input Variables in the object tree on the left. Right click and delete each input variable. This edition of VISUAL Did You Know is brought to you by BizTech VISUAL Consultant, Ivan Wilson. Join Tony Gunter, Business Consultant from Infor, for a review of the issues discrete manufacturing companies face in supply chain scheduling. Tony will share from his deep domain knowledge with Infor10 ERP Express (VISUAL) and share the benefits you can obtain with this leading scheduling solution for companies your size. You will also hear from Mike Wandler, President of L&H Industrial on how his company is using Infor10 ERP Express (VISUAL) and the powerful scheduling capabilities to improve throughput in his organization by more than 30%. L&H is a leading after-market supplier in the mining industry. They are a world-class rebuilder of heavy mining equipment and engineer, design and manufacture alternative replacement parts for the surface mining industry. Virtualization is the future for delivering ERP Systems and other IT services to your end-users. It’s a reality! So, if you’re looking to make the leap to a virtual infrastructure, or want to take the next small step to optimizing what you already have, read on. With several great options available to the midmarket, many smaller businesses are discovering the virtues of going virtual too. Reduced total cost of ownership: Consolidating your servers from many disparate physical servers to fewer, better utilized virtual servers saves more than storage space — it can save money. It also helps simplify your infrastructure to reduce admin time and hassle. Not to mention, the centralized delivery of your Manufacturing ERP Software Systems. Easier, cheaper support: Replacing desktop PCs with thin clients further simplifies your infrastructure. No moving parts mean fewer breakdowns and happier, more productive users. Smaller electricity bills: Fewer servers and lower energy consumption lead to an office that’s kinder to the environment. Greater peace of mind: Server virtualization also makes backup and disaster recovery simpler and faster. Businesses of all sizes can enjoy a higher level of business continuity and data protection. The benefits are extensive, yet many midsized organizations are still lingering on the doorstep of virtualization, or have started the journey, but won’t take the next step. Don’t hesitate! Wherever you are on the road, there’s a bump-free way forward. Want to know more about virtualization? Talk to one of our Solution Advisors at 419-539-6922 or via email at info@gobiztech.com. Hamilton, OH – September 30, 2011 – Rapid Quality Manufacturing, Inc., a provider of Direct Metal Laser Sintering (DMLS) for the aerospace, medical and dental industries, selected Infor ERP VISUAL manufacturing software to improve their business processes. RQM began a Fast-Track implementation of the ERP Software in June and went live on August 1, 2011. The solution was purchased through Business Technical Consulting, LLC (BizTech), an Infor Channel Partner in Toledo, OH, and BizTech provided the Implementation Support. The functionality of Infor ERP VISUAL manufacturing software will enable RQM to improve their operational efficiency and manage the flow of their business information. Prior to Infor ERP VISUAL, RQM was using both QuickBooks and a separate manufacturing application. The selection team ultimately chose VISUAL because they wanted completely integrated manufacturing and accounting system that was cost effective. Lot Control and Quality Management (VISUAL Quality) were also important factors in their decision. About Rapid Quality Manufacturing, Inc.
RQM, North America’s first production-focused company for additive metal fabrication parts, began operations in 2007, providing Direct Metal Laser Sintering (DMLS) for the aerospace, medical and dental industries. DMLS technology is a laser-based process that sinters 20 micron sized metal particles layer by layer, building 3-dimensional parts in a matter of hours and days. RQM’s entire focus and business model is the creation of higher-volume production parts using DMLS and other additive fabrication technologies. Do you need to roll out Infor10 ERP Express (VISUAL) to new users? Does training take too long and cost too much? If you had to grade your users, how would they rate? Have your processes changed over time? If you answer yes to any of these questions, then we have a solution for you. During this webinar you will hear about real customer experiences with Infor EPAK (Enterprise Performance Accelerator Kit) and learn how EPAK has helped many organizations solve these business challenges and more. conduct user-acceptance testing, business process reviews, and approvals. and web-based training, as well as usage tracking and user-acceptance training. deliver job aids, product assistance, simulations, and application coaching. Don’t miss this session. Reserve your seat now. Did you know that you can manually enable Visual Help or Books Online files? Under certain conditions in some Infor ERP VISUAL 6.5.x environments, security can impede the ability of VISUAL Help or Books Online from launching. 3. Right Click the Help folder. 4. Select New then String Value from the menu and add a new entry (Example VM.CHM). 5. Double click the new entry. Presto! VISUAL Help / Books Online is now enabled.